The third industrial revolution has begun, slowly — almost invisibly. Start preparing now for what’s to come, based on our experience with the previous two and reasonable guesses about the future. This requires us to more clearly see the world than we do today. And to act together, coherently and more wisely than we do today. We can do this. These posts link to a wealth of information and speculation, helping you to prepare for what is to come. Dynamics of the robot revolution. First signs of the robot revolution appear. Are we exhausting our natural resources? Good news: the singularity approaches! Must our population grow to ensure prosperity? — Spoiler: not as the new industrial revolution destroys jobs. Economists grapple with the first stage of the robot revolution. A Timeline for the Extinction of Jobs by Machines. 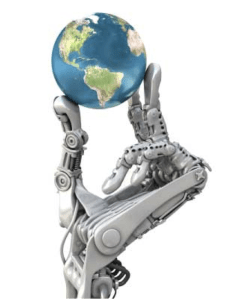 4GW: A solution of the first kind – Robots! — Military applications. In Friday’s job report you’ll see early signs of the robot revolution! Krugman discovers the Robot Revolution! 2012: the year people began to realize the robots are coming. Journalists reporting the end of journalism as a profession. The next step of computer evolution: becoming bloggers. The next industrial revolution starts. Beware the Pied Pipers who lull us into passivity..
Tech creates a social revolution with unthinkable impacts that we prefer not to see — About sexbots. The new industrial revolution has begun. Research shows more robots = fewer jobs. Book and video rental stores show the coming singularity. Let’s prepare now. Hype about 3D printing & dreams of American reindustrialization. Hope is more fun than reform. — From March 2013, at peak hype about 3D printing. Potentially horrific effects of drugs and machines making people smarter & stronger. About Amazon: One graph that says much about America, and our future: the growth in jobs vs. food stamp use. For Thanksgiving, Walmart shows us the New America. The CEO of Boeing enjoys the sight of his workers cowering. Let’s feel their humiliation. Happy Meals: now with 20% less people! — McDonalds automates. (6) Will it boost inequality? Robots are the solution to our problems, if we enslave them — The different economies of Star Trek and Jupiter Ascending. AI will reshape the world. Films show how. Stratfor explains why self-driving cars won’t rule soon. Good news: The Singularity is coming (again). The Singularity is in our past. Steps to make the tech revolution boost America, not just the 1%. (11) Are we exhausting our natural resources? Bad news for India, probably for China, perhaps for the US as well, 11 September 2009 — Water! “The Growth of Low-Skill Service Jobs and the Polarization of the US Labor Market” by David Dorn and David Autor in American Economic Review, August 2013 — How jobs and wages changed in America from 1980-2005. “The Global Decline of the Labor Share” by Loukas Karabarbounis and Brent Neiman in Quarterly Journal of Economics, 1 February 2014. Gated.